There are certain laws which govern all things and conditions. There are laws of music, mathematics, health, happiness and so on, and, therefore, there must be some law of prosperity. And if we are to demonstrate prosperity, we must learn to know the law, that we may work in accordance with it. Jesus Christ was the greatest teacher and demonstrator of this law of prosperity. He told his followers that they were to seek first the Kingdom of Heaven, not some place in some other planet away off somewhere, but within themselves; that they had within them all resources, and they must unfold their capacity. This was the first step in demonstrating prosperity, the recognition and seeking the Kingdom of Heaven within, as the source of all, and upon which we may draw for whatever we may desire. Then he tried to illustrate and demonstrate the law to them by multiplying the loaves and fishes, and by turning the water into wine—better wine than they had had before—and by finding the gold in the fishes mouth; and by the great draught of fishes when they cast their net on the right side. And so we manifest in proportion as we become more and more spiritual and put into practice this law. You ask, then, why do we, who know this law, not demonstrate for ourselves large fortunes, etc. By way of illustration I would call your attention to the electric light plant. There must be some one at the power house in touch with the machinery which produces the electricity so that he may turn on the current that we may receive the light. So we stand in touch with the power house and turn on the current that you may receive the light, or benefit. In every large law firm, there is an attorney who appears in the foreground before the people, and also one who stands in the background, or a counselor to whom the attorney may go for counsel. Here we take the part of the attorney, and we go into counsel with the great Counselor, that we may bring to you his message. What we want is spiritual enlightenment and wisdom. All ability is based on spiritual understanding. Prentice Mulford said, “The man of success is the man possessed of the greatest spiritual understanding, and every great fortune comes of superior and truly spiritual power.” Do you want the wealthy to divide with you? Jesus called those “foolish virgins” who wanted others to divide. He taught that you must have oil in your own lamps. Know that you have an abundant supply within yourself. Wanting the rich to divide is simply covetousness. It is the thing that will keep you poor. Several years ago when I was in Edinborough I wandered into one of their churches. I do not have any idea that the clergyman was a student of New Thought, but he was a Greek scholar. (Edinborough is called the Modern Venice). He gave out his text, “Let your conversation be without covetousness; and be content with such things as ye have.”—Heb. 13:5. Do you think he told these good Scotch people to be content with their little cottages? Oh no, not a bit of it. He took his Greek Testament and translated direct from the Greek language and it read, “Be ye conscious that ye have contained within yourselves, all capacity,” and then he went on to explain that by coveting other people’s things or gifts, we would only be hanging onto our little tree things which would deaden the life within ourselves. And this is what is meant when we say that we must be conscious that we can create from within ourselves the things which we need; that we do not need the things from the outside, but that they come from within. We want then, like Solomon, to pray for wisdom. We must use our own minds. When you get into the fulness of spiritual consciousness you cannot get away from prosperity. Read Deut. 28:11-15. Prosperity is a manifestation of superior ability, and ability comes from God, the Divine Mind. Covetousness does not bring forth prosperity. If we, as healers of the sick, must work to get rid of the sin or shortcoming, the “missing of the mark” back of the sickness, so in the study of the law of prosperity, we must work to get rid of the sin back of the poverty. In demonstrating we must first recognize that there are constructive and destructive thoughts, and that negative thoughts have their influence as well as harmonious thoughts. Under the heading of destructive thoughts comes criticism. We cannot criticise the methods of the wealthy. Just leave them to God and bless them. Every time you say grafters, or criticise the rich, you set in motion that law which locks the door to your own prosperity. Neither can we demonstrate health by seeing poverty. In the law of vibration we know that a word spoken in the silence, as well as aloud, produces an effect. Then know that God is the infallible Source. Speak the word and constantly affirm it. 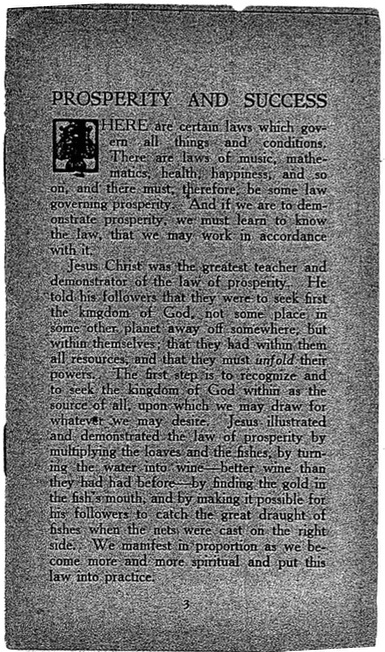 Never say, “If John Jones, or William Smith, or somebody else would pay me, I would have plenty.” Say firmly, and believing, ‘‘My expectation is from God, and all the ideas of God (that is all people) are channels of supply to me,” and whatever you may be doing always say “I am doing this for God,” or “as unto the Lord,” whether it be ruling a kingdom, or even if it is factory work, or washing dishes. Remember that we are at-one with whatever we declare ourselves in unison with. There is an abundance of supply to satisfy all our highest aspirations, and we are justified in having all that can bless us and be helpful to us in any way. The individual man is lord over all his circumstances. The successful man puts his thoughts into his work. Circumstances and other men cannot hinder him. When we are in the right mind all things work together. “The King’s heart is in the hands of the Lord, and he turneth it like the rivers of water, whithersoever he will.” All our circumstances begin to move in the right direction as soon as we take the right attitude. Then to succeed we must first have no destructive thoughts, no criticism. Second we must have our ideal. Live with an object in view, and measure up to your ideal. Use your imagination. Visualize. See it as already done. Do not think I mean idle dreaming. I mean definite, persistent work. It cannot be done by random thinking. You must develop an “equilibrium of understanding.” That which makes the successful man is steadfast, invincible concentration and determination. What is satisfaction? I do not mean you shall be satisfied with the limited consciousness in which you are living. Make your picture of what you want to be, and then live up to it and make it real. The men of success in this world have been men who started with but little or no means and who had the fewest advantages; for instance, Andrew Carnegie came to America a poor Scotch boy, and his mother, after they arrived, used to bind shoes to help support the family. Harriman was one of six children of a poor clergyman, whose salary was but $200.00 per year. Sir Thomas Lipton, when a young boy came to America, and when he landed he had just twenty-five cents in his pocket. He was the first one on deck the morning they landed, the first to see the shore, and was the first one to land. He could see two hotels near and went direct to one of them, asking how much they would give him for each guest that he would bring them. They told him 25 cents. He rushed back to the boat, made himself useful by helping his fellow passengers, and took enough of them with him to completely fill the first hotel. He then went back, and got enough to fill the other hotel. This was his financial start in life. Turner, the great artist, whose father was a barber in the slums of London, had no early advantages, yet around his pictures in the gallery you will always find a crowd, and someone has said, if you will come back five hundred years from now, you will still find a crowd there. All of these were men with almost no education and no early advantages or favorable circumstances. They carved their own circumstances, and they are men who have made their mark in the world. If you are in need of anything, you can have it through starting the right thoughts, but you must start them on a high plane. Mind attracts or repels, and by understanding the law you can have whatever you rightly construct. You cannot have it by random thinking. There is a law of right thinking by which it is possible to bring right results. There is a power that will bring us our own if we put ourselves in line with the one omnipresent good. We must enter into the spiritual consciousness that sends out the right vibrations. Get into the One Mind and rest in the Absolute, and say “All thine is mine.” Let us think abundance, and trust God for our temporal things. Say “The Kingdom of God, the power and almightiness of God is demonstrating success in all my affairs.” If you hold the thoughts that you have taken God into your affairs you will be successful, for there is a great All-Penetrating Spirit-Substance waiting to be formed through your word. A little incident in the life of Mme. Tetrazzini illustrates how this law is set in motion, and her attainment shows the result. A friend of mine once heard her in a small theater in London when she was a poor struggling beginner, with shoes run down at the heel, and second hand gowns that were too large for her. After the performance this friend sought and obtained an interview with her, and in answer to words of encouragement she clenched her little fists and stamped her little foot, with its worn out shoe, and said “I can and I will succeed.” And it was through holding this attitude constantly, not letting go of it for one instant, that she was enabled to attain her present success. I tell you if the Kingdom of God is set up in a man’s mind, it makes him a wonderful sovereign over all his circumstances, and can make him master of his surroundings. If you are at one with, and acknowledge the power of God, all things will be possible unto you. “Eye hath not seen, nor ear hath not heard, neither hath it entered into man’s mind, the things which God hath prepared.” There are abilities in your own mind which will come forth as you rely implicitly on the one and Only Mind. But you must get still. Still the outer self. Outward appearances have nothing to do with the reality.